ReStore 2.0 opened to the public January 18th, and has created quite a buzz in the community since. After years of planning and a true community effort, our affiliate finally has a “Home” of our own, and built with the same environmental consciousness that we put into the affordable housing units we build. With our desire to have the best ReStore in the country, customers are delighted from the moment they pull into the parking lot with an attractive building. The improved one-stop customer shopping experience was on the forefront of the design team focus. We wanted a bright, open, spacious uncluttered showroom, where we could display the extensive treasures, that are donated to us from our amazing donors, in an easy to shop space..
Also keenly aware that we had a sustainable business model that needed a permanent location in the valley, versus their prior situation of rising rents and moving from store to store which was inefficient and costly. Through a construction loan from Alpine Bank, an affordable mortgage from USDA Rural Development, al grant from CORE, and donations from the founding partners (Alpine Bank, Bob Young, Connie & Jim Calaway, Bighorn Toyota, The Gardener Foundation, and the Morgridge Family Foundation) the dream became a reality! In the end, we are saving money by owning our own building and guaranteeing a stable future for employees, and all the while building more affordable homes within our community. 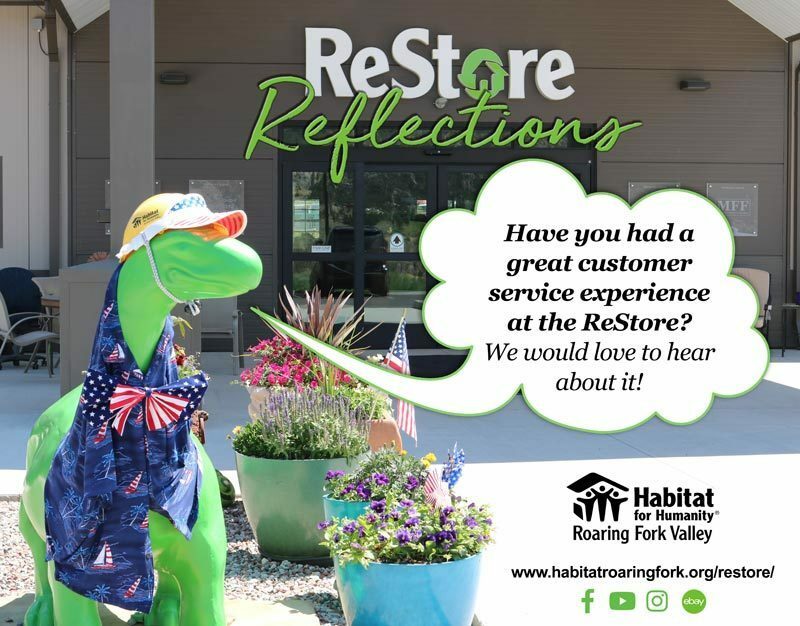 Opening ReStore 2.0 has allowed Habitat RFV to appeal to even more customer needs by providing new purchased products, such as: mattresses, “scratch & dent” appliances, flooring materials, and rugs. In addition, we are now taking orders for custom kitchen cabinets and bathroom vanities produced by prison inmates learning a marketable skill for when they are released. The prices are so much better now that they are in the new building. Wow, over 40,000 sq. ft. of shopping. I go all the time now, it’s the place to go first, before shopping at the stores with new furniture. Gorgeous merchandise. A hidden gem full of unique and eclectic home furnishings. We stopped in for the first time last weekend and will have to make regular visits. The valley is very fortunate to have a place like this. Please take a look around with our interactive tour.